We offer World Best Powder Coating Equipments to our clients at a market Competitive prices. These equipment are based on the Latest Technology and safe to use. The new age powder coating gun is light weight and perfectly balanced. The equipments have touch trigger, which helps in fatigue-free operation. 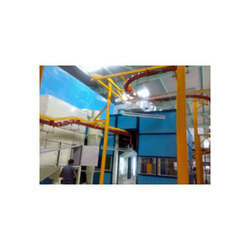 These equipments are well suited for all types of powders and any type of working conditions.The patented technologies of ITW GEMA over come the Faraday effect,so these powder coating guns gives perfect penetration in tough geometries.Our powder coating management systems provides excellent automatic powder coating application on the components and optimum use of recycled powder with negligible wastage.Our powder coating management system provides the flexibility of the color change in minimum 20 Minutes. We support you from Concept to Commissioning, we provide paintshop turnkey procjets. If you provide us your requirement with Size and weight of the components with desired production rates and final specification of the finished product we shall design a most appropriate and cost effective plant on turnkey basis. We can also assist you in tying up with all other service providers such as Chemical, Paint, Water and Effluent Treatment suppliers.